Fear. Yeah it is something that can sink in pretty deep. Every day I find myself fearful of something and everyday I try to conquer it. Maybe it is an email I am frightened to send. Maybe it is a new idea that I have but just thinking of making it happen scares the you know what out of me. Well I am here to tell you that being brave and facing those fears will get you much further than sitting behind them and succumbing to the pressure. I promise that at the end of the day you will be prouder of yourself of facing your fears than if you didn’t. Even in the face of failure you should find success in taking the plunge. Everyday I set goals mentally of something I will do that day that will push me further. I try to find a way to feel braver, more confident in what I do than the day before. When you work for yourself, manage a brand you represent, and/or really want to make your dreams happen, this is critical. Getting where you want to be is no easy task and you won’t get there full of fear. It is the fearless of us that will make our dreams come true. So how will be be brave today? Love this! I’m finding the more I think about something I fear, the more I psych myself out about it. If I just stop thinking and start doing, I usually find things aren’t as bad as I thought they would be! I think I’ll go make that phone call now. I love this – and I love how pretty you like in the photo! It’s so nice to read this. I think this is the best advice. To know we are not alone in our fears, big or small is a real comfort. We need to celebrate and be proud of each step we take and fear we overcome. Thanks!!! Thank you so much for this Megan. I really needed to hear this today. Here’s to being fearless! I just did this… I made my new blog public! Love this, girl. Thanks for the little reminder that it’s cool to be afraid, as long as you walk through the fear and not turn away from it. Since I officially allowed myself to fail and to see it as an inevitable step of learning and growth, life definitely became easier. You’ll find the poster in A4 as a free download in the ‘Free and Fun Stuff’ section of my website in case you’ll need a reminder, too. 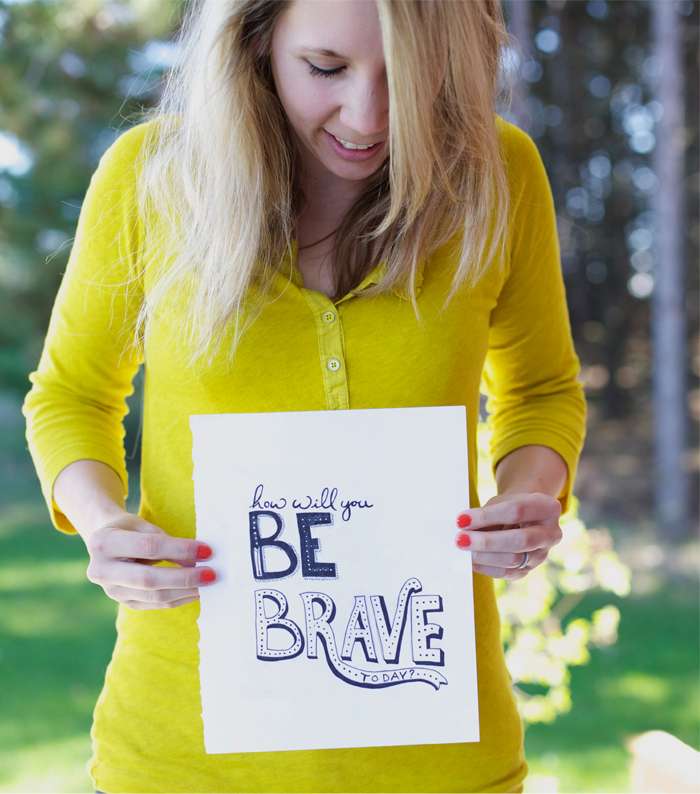 Have a brave and great day, all of you! I look forward to these post every week and this week I defiantly needed these words to be brave! These are so pretty and the words are powerful! Thank you!